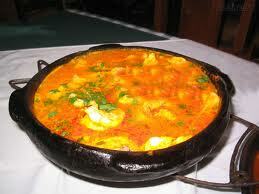 Muqueca is a fish stew with tomatoes, red peppers, onions, coconut milk and palm oil. It's quite simple to prepare and goes very well with plain white rice. Although Muqueca comes from the North Eastern state of Bahia, it's eaten throughout Brazil. 1 Place fish pieces in a bowl, add the minced garlic and lime juice so that the pieces are well coated. Sprinkle generously all over with salt and pepper. Keep chilled while preparing the rest of the soup. 2 If you are planning on serving the soup with rice, start on the rice. Bring a couple cups of water to a boil. Heat one Tbsp of olive oil in a medium saucepan on medium high heat. Add the chopped 1/2 onion and cook, stirring, until the onion is translucent. Add the garlic and cook for 30 seconds more, until the garlic is fragrant. Add the raw white rice and stir to coat completely with the oil, onions, and garlic. Add the boiling water. (The amount depends on your brand of rice, check the package. If no amounts are given, add 1 3/4 cup of water for every cup of rice.) Stir in 1 teaspoon of salt. Bring to a simmer, then lower the heat, cover, and let cook for 15 minutes, after which, remove from heat until ready to serve with the soup.